Thinking and feeling are the decision-making (judging) functions. The thinking and feeling functions are both used to make rational decisions, based on the data received from their information-gathering functions (sensing or intuition). Those who prefer thinking tend to decide things from a more detached standpoint, measuring the decision by what seems reasonable, logical, causal, consistent and matching a given set of rules. Those who prefer feeling tend to come to decisions by associating or empathizing with the situation, looking at it 'from the inside' and weighing the situation to achieve, on balance, the greatest harmony, consensus and fit, considering the needs of the people involved. In the Meyers-Briggs Personality terminology, Thinking and Feeling are two different ways that people make decisions. (Sensing and Intuition are how people take in data. Thinking and Feeling are how they act upon the data they've taken in.) But I think there's another aspect to this whole T/F thing that I've never heard talked about anywhere (except in Meirav's recent post, which I think was in part a response to something I'd said in another one of her posts, which I can't find now). It seems to me that there's an energy or "bandwidth" component to this as well. I've often heard Introversion vs. Extraversion explained in terms of energy. If new people or places energize you, then you're likely an Extravert. If you're drained when you're with people and energized when you have time alone or with a few close friends, then you're likely an Introvert. But what if you're hanging out with someone that you're very comfortable with and who you like to be with, but you can't handle too much time with them if they're emoting a great deal? I don't think it's just a "T's don't like emotions" sort of thing. I think there's something deeper. I know that when I'm confronted with a great deal of emotion, especially negative or depressing emotion, I just get to the point where I want to hide away in a closet and be alone. It's the same reaction I have to being forced to hang out with a jillion strangers, only it's actually more profound. The crowd of strangers makes me feel very uncomfortable and awkward and out of place and I want to hide away mostly so that I can feel normal again. But the outpouring of emotions, even from someone I'm close to, can make me feel weary, and even somewhat trampled and injured. It's then that I want to hide away in order to heal. Overwhelming positive emotions can be a bit... ewey, too. People tend to be a lot less effusive when they're happy (either that or I just don't hang out around places where people are over-the-top happy -- like San Francisco has been over the past couple of weeks), so I think that's the main reason I deal with it better. But I still feel sorta slimed, sometimes. It's like someone is taking something that's intimately theirs and shoveling it on top of me. It doesn't make me feel really good. Having said all this, you probably think I hate emotions - period. But I don't think that's true. There are times when emotion is beautiful or deep or touching or bonding or able to express something in a way words simply don't. I can appreciate that. I understand that. I get it. Emotions have value. But too much emotion quickly undoes all the good and leaves me wanting to crawl into bed with a good (but not too emotional) book and block the world out. That feeling of overwhelming weariness hits me and I just can't handle the emotional stuff any more. I get lethargic and apathetic and want to give it up for the day. ... Then someone tosses a good metaphor my way, or an interesting idea, or a logic puzzle, and suddenly I have the energy of a kitten after a nap who has just found a ball of yarn. Suddenly I'm awake and invigorated and my mind starts moving at the speed of light. I'm still not certain that this is strictly a T/F distinction. I'm surprised that I can't find anything about this online. (Anyone have a good link for me?) I'm curious to hear what your thoughts/experiences are. 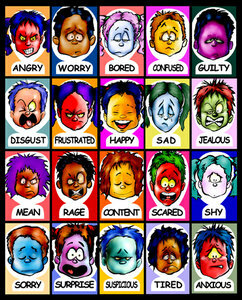 There's also the flip side - my emotions and how I express them. 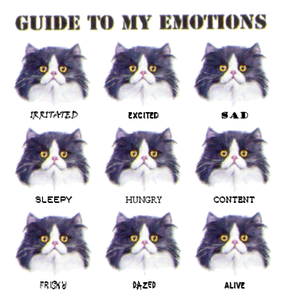 (I found the cat picture while googling for images on emotions and couldn't resist including it. I think T's are often read as being emotionless, even though from the inside looking out, we feel that we have quite a range of well expressed emotion.) Expressing emotion can be just as draining for me as responding to someone else's emotions. I'd much prefer to express my emotions in private. In public, if someone talks to me about hard and emotional issues (like how Nathan's doing) I spend half my brain power wondering what kind of emotive expression they're expecting from me and how I'm supposed to manage that. Will they think I'm cold and uncaring if I just nod and agree that things are hard? Do I have to get moist eyes or even shed a tear? Should my voice quiver? Will they hold it against me if I just give my "I'm not sure what I'm supposed to do right now" grimace? What I find particularly hard is the divergence between the need of some people to emote and my inability allow them to emote without feeling pulverized by it all in the end. I do it. I know my dear friends, and daughters, need time to emote and they want to do it with me because we're close. It's really a privilege and I realize that. It's a good thing. And yet it's hard. Why does it work that way? How can I make it less painful on my end? How can I still be a good listener/emotion-receiver for them? What's the trick? Any ideas? What if the emoting is done like this on the computer. Is that easier? Then people just see words and not the expressions or reactions. except that i wasn't emoting when i wrote this. it was more thoughtful - idea oriented. the short things about nathan tend to be more emotive. it helps that they're short because then i can express my feelings but not get all tangled up in them. dwelling too long on something just makes it escalate till it's out of control. then i can't sleep at night, can't eat, wander around the house not getting anything done. it pretty much incapacitates me. at the same time i'm surrounded by people telling me that i need to act and i need to do it loudly and yesterday. yup, that's the one! thanks. being an F, I find myself immediately slipping into empathy mode, wanting to say things like: I hear you, it sounds really tough, etc etc - all the stuff you probably don't want. I wish I knew how you can make it easier for yourself. I'm married to a T (who is also an I) and I know he is aware of having to be careful in rationing emotion-time, he knows that listening to people talk about their feelings is not something he can do too much of. But obviously it's more difficult to do that rationing if you're a mother, especially with two daughters who need to emote. it is very difficult for those of us who are more emotion-oriented to cope with the feeling that someone who is close is shutting us out and not allowing us to emote when we need to - I speak from hard experience here, it's been a struggle for me to learn to cope with those times when my husband seems cold and unfeeling. Understanding about the differences helps in terms of what I can tell myself when it happens, but emotionally it's still difficult. As annoying as it may sound to an F, I almost always default to giving advice or problem solving when someone I care about emotes. It's my way of empathizing...and doesn't end up draining me too much because I approach it as a puzzle to fit together neatly. My other default is by deflecting strong emotions with humor...which is much more readily accepted to an F, though is not appropriate in every situation. It's how some of us Ts are capable of showing we care...but I know it really pisses off some Fs. it takes a lot for us Fs to understand that - but thanks to my friendship with Meg and her endless patience with my tantrums, I'm learning. for me as an F it means taking a deep breath when it happens and saying to myself: this really is the best this person can offer you - sure it's not what you want or need, but it's really all they can do. i think the hard part (and i think i brought this out in this short poem) is that people are doing their best, but it doesn't connect. i wonder if we would get better at loving in the way a person can receive if we received better feedback on it when we do it. I think one of the best bits of advice I've ever had was from this guy I knew who had been bereaved, I'd been to the funeral and chatting with him a long time later I said something to the effect that at the funeral I had felt really awkward and didn't know what to say (see, even Fs have those moments!) and he said he thought he'd have found it helpful at the time if I had said just that: I really don't know what to say. but then it also depends on the situation. I think if you're in a one-to-one with someone and they're sharing some painful feelings, you kind of have to say something - even if it is just "I can see you're hurting and I don't know what to say" - whereas if there's a whole bunch of people to hand, you can just leave it to the Fs to deal with it. which reminds me of something that happened once when I was staying at a retreat house and there was this couple running it, he made the mistake of asking me how I'm doing at a moment when I was very close to falling apart... as soon as he saw the tears starting he looked totally panic-stricken and ran to fetch his wife. poor guy, obviously a T - now I can understand him better. and fwiw, this cross-personality awkwardness goes both ways. because I'm conscious that you, Meg, are a strong T, when I read stuff that you post and it's obviously painful, I feel I'm struggling, not sure how to respond, because I'm pretty sure that my natural response wouldn't be helpful to you - on the contrary, it will probably make you feel worse. so sometimes I shut up and say nothing, and trust that your T friends will deal with it.